Shisaku: Chutzpah Redefined, Or Just Money To Burn? 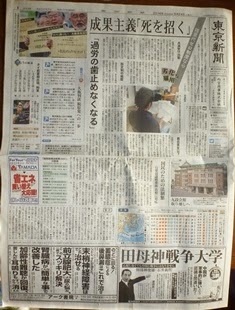 My morning dead tree news delivery device, the Tokyo Shimbun, the alpha dog of the prefectural newspapers, is left wing. 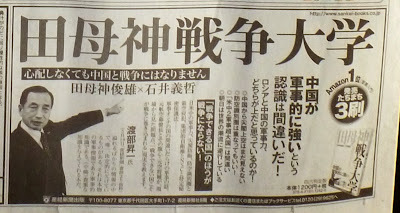 It holds court, in most analyses, in the space between left-leaning The Asahi Shimbun and the Communist Party's house organ Akahata ("Red Flag"). Hence my amazement at this morning's front page. See it? It is hard to miss. But, just in case, here it is, the bottom-right hand corner, enlarged. I know that advertising can be scattershot, sometimes lacking in aim at a target audience. 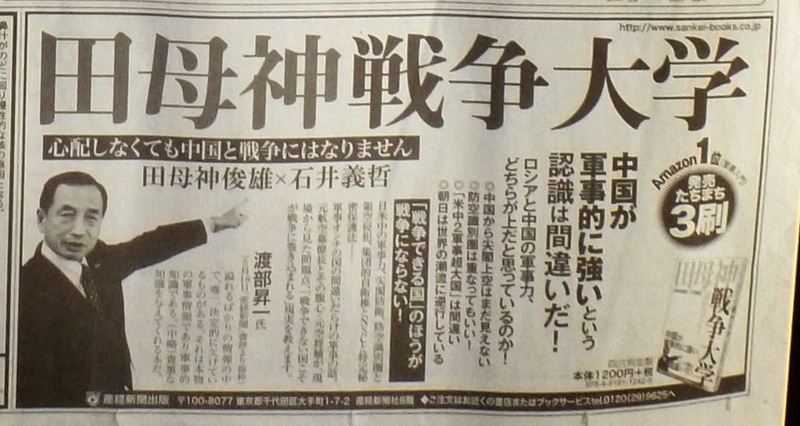 But having an ad for a Tamogami book on war, photo of the man lecturing the reader included, on the front page of the Tokyo Shimbun is beyond mere incompetence or laziness. I hope their readers will be up in arms. I’m not holding my breath, though. Could it merely be a case of "money talks, bullsh*t walks"? It seems like a virtue that Japan is a consensus-builder and not an ideologue, but Japan is a consensus-builder to the point of being morally empty sometimes, I think. The Money Gods prevail over all else.